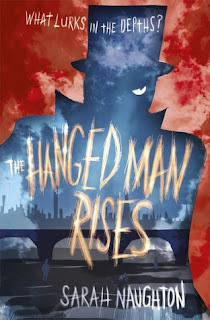 Today, I am happy to welcome debut author Sarah Naughton onto the blog, to discuss what inspired her to write her historical teen book, The Hanged Man Rises. Living in the country is pretty boring once you get past the age of nine. Especially for a girl with zero interest in sport or other outdoor activities. With nothing better to do me and my friend Ellen would go on interminable walks down country lanes and on these walks, when the conversation ran out about Andrew Stowford (the only boy in the village not intimately-related to everyone else), we played a game called What If. I probably don’t need to explain this game. It went along the lines of: what if your best friend’s boyfriend told you he loved you: would you tell your best friend? Or, what if your mum and Andrew Stowford were trapped in a burning building and you only had time to save one? Lots of things trigger the questions: documentaries, conversations, news stories. What if that asteroid that just missed earth actually hit us? What if they found fossilised human bones in a dinosaur’s stomach? I’m sure it’s where most writers begin. The medical advances in the 18th century, particularly in anatomy, probably inspired Mary Shelley to write Frankenstein. Genetic engineering provided the chilling but wholly believable premise for Kazuo Ishiguro’s ‘Never Let Me Go’. A planet running out of resources: Independence Day, reality TV gone mad: The Hunger Games. Ok, I suppose I should admit that I’m a big fan of dystopian fiction. But it works equally well with other genres: what if you lived in Elizabethan/Roman/Neolithic times? What if a man got killed in a completely sealed room? What if a billionaire sheik disguised as a doctor came to work at the hospital of a pretty young nurse? Though it didn’t feel like it when I was a kid, having an active imagination is a far more exciting and rewarding skill than being a hot shot at BMX stunts (unless you’re Andrew Stowford, in which case it’s just the Best Thing Ever). So if you want to write, just be curious. Ask yourself questions. Chances are lots of people will have asked themselves the same questions before and written brilliant books exploring the answers, but one day you’ll hit upon something no-one has asked yet. But you’d better be quick – what if I get there first? The Hanged Man by Sarah Naughton is published on the 28th February by Simon and Schuster.